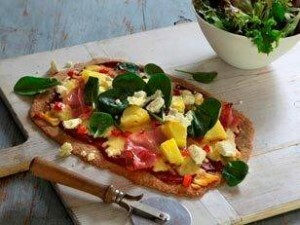 This gourmet take on traditional ham and pineapple pizza is bound to be a crowd pleaser! Spread into a 12 x 8 inch pizza pan baking dish coated with cooking spray. Serve slices with a generous green salad topped with toasted slivered almonds.